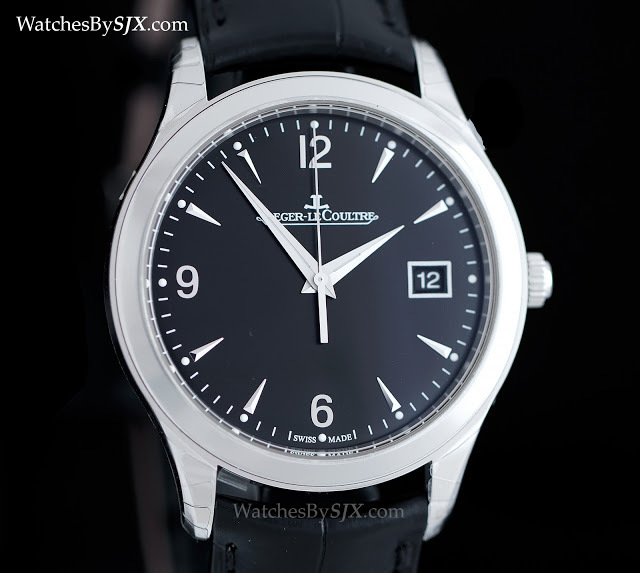 How Good is Jaeger-LeCoultre’s Most Affordable Men’s Wristwatch, the Master Control Date? 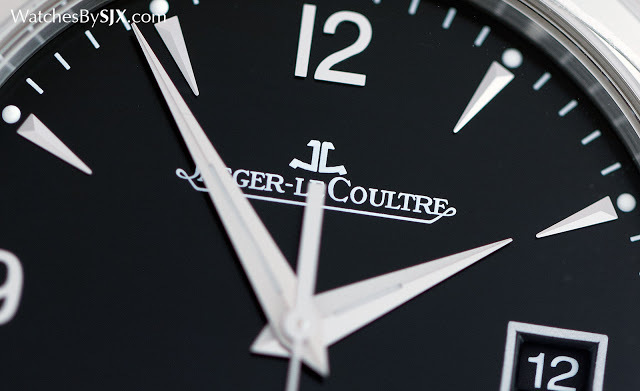 A solid gentleman's wristwatch, the Master Control Date is the lowest priced men's timepiece from Jaeger-LeCoultre, but it is still equipped with an excellent in-house movement boasting features typical of more expensive watches. Jaeger-LeCoultre‘s most affordable men’s wristwatch is the Master Control Date, priced at just under US$7000 (or S$10,000). For that you get a stainless steel case and classical but functional design, as well as an attractive, in-house movement, the calibre 899. The same movement, in fact, that’s found inside the pricer Geophysic limited edition. A movement of this quality at this price is only possible because Jaeger-LeCoultre is one of the most accomplished movement makers in Switzerland, able to blend high horology and production on a large scale. The steel case is 39mm in diameter and 8.8mm high, modest proportions and thin enough to make it elegant on the wrist. A clean, round form with a consistent mirror-polished finish on all surfaces, the case is good quality but ordinary. But it is practical, with a water-resistance of 50m, enough to endure a tropical storm or accidental dunking. Similarly, the dial is simply styled, with the dauphine hands and arrowhead markers typical of JLC’s Master line; the recent Master Calendar Meteorite sports the same look. It’s a pleasant look reminiscent of mid-20th century watches; the original Master watches of the 1990s were modelled on the LeCoultre Futurematic of the 1950s after all. The dial is legible, even at night, with luminous dots at each of the hour markers, along with a narrow strip of Super-Luminova along the hands. All of the hour markers, including the Roman numerals, are applied. This specific model with a black dial is new, having been introduced at SIHH 2015. It’s an addition to the existing models with silver dials. Notably, the black dial is paired with a black date disc, instead of the stock white date disc that is often found on dark dial watches. What’s really important here, and the majority of the value in the watch, is the movement. It’s the calibre 899, an automatic movement with a short 38 hour power reserve. Like many of the other time-only movements Jaeger-LeCoultre makes today, the calibre 899 evolved from a movement designed decades ago – remember that Jaeger-LeCoultre was a movement manufacturer first and foremost historically. The calibre 899 is the result of three decades of steady improvement. 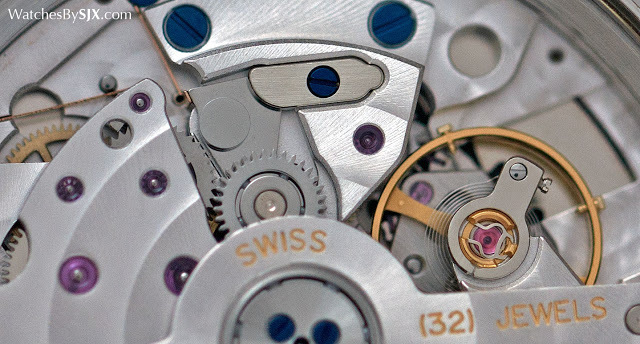 That process has been enhanced by the fact that because Jaeger-LeCoultre supplies other brands, its movement production is significantly larger than its watch production, giving it a larger sample to study. 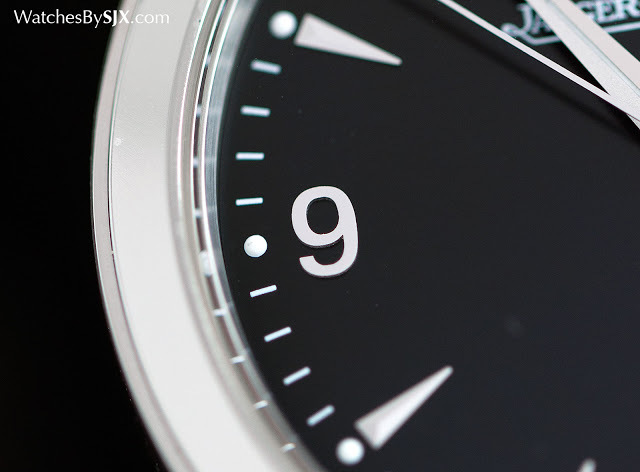 Today’s calibre 899 is essentially an improved calibre 889, first introduced in the 1980s. 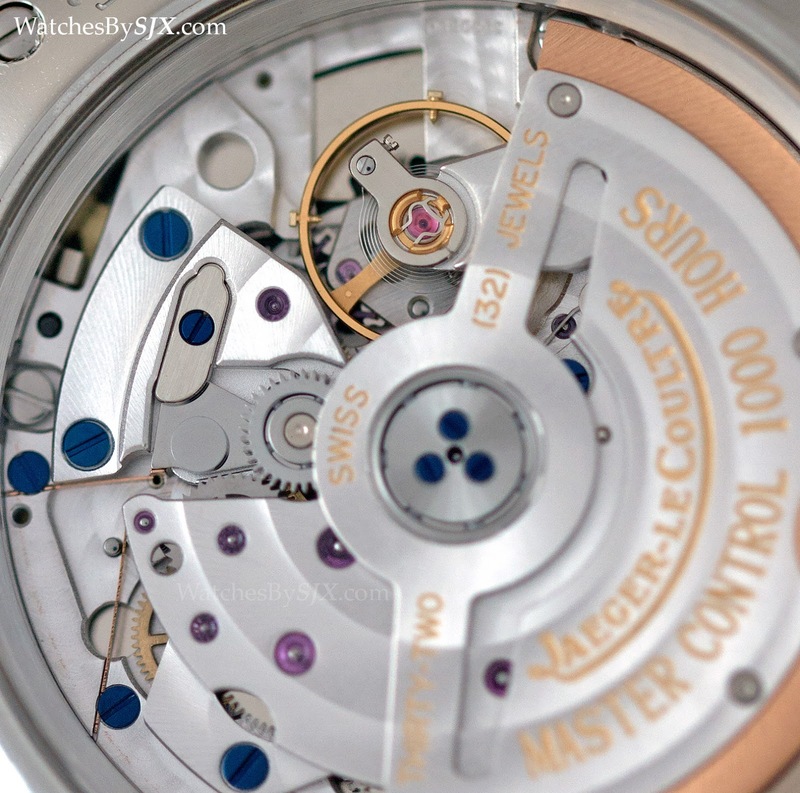 That was once one of the most commonly used automatic movements in high-end watches (found in watches from Audemars Piguet, Vacheron Constantin and IWC). But the modern calibre 899 has been significantly upgraded, most notably with a free-sprung balance, friction-free ceramic ball bearings for the rotor, and a simple unidirectional winding mechanism (replacing the more complex bidirectional switching rocker of the 889). The result is that the calibre 899 is a robust and reliable, with many features traditional associated with high horology, but manufactured on a large scale, making it affordable. The movement decoration for example is attractive and carefully done, but clearly executed mechanically. The blued screws, for example, are blued with heat (not a quick and easy chemical bath), but in an oven thousands at a time. And the balance wheel with adjustable weights for regulation is usually found either in much more expensive watches, or watches made in enormous quantities (the adjustable mass Microstella balance is standard in Rolex movements). 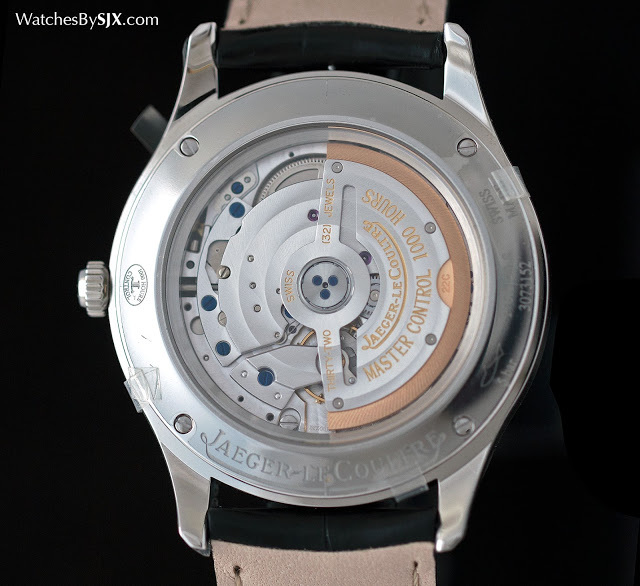 While Jaeger-LeCoultre is practically alone in Switzerland in this segment of movement making, some brands outside of the alpine nation also offer excellent movements at affordable prices, though not quite like how Jaeger-LeCoultre does. Nomos for example manages to offer sophisticated and attractive in-house movements in watches priced at about US$3000 (like the Tangente Automatik), but these movements still lack the finer elements of the Jaeger-LeCoultre calibre 899. And Grand Seiko movements are technically brilliant, but Seiko is still developing its ability to do fine movement decoration on a large scale, although they have succeeded brilliantly on an artisanal scale. Jaeger-LeCoultre is probably the only watchmaker that has successfully combined both mass production and fine watchmaking consistently over a long period, which is why watches like the Master Control Date are possible. And importantly, its prowess covers the entire spectrum, extending to ultra-complicated movements like the multi-axis tourbillon in the Gyrotourbillon 1. It’s worth noting that the calibre 898 inside the Geophysic limited edition is essentially identical to the movement in the Master Control Date, except that the Geophysics lacks a date display. The Geophysic, however, retails for over 40% more than the Master Control Date. So the Master Control Date is a pretty good buy, priced at US$6850 or S$9850 in steel, for both the black and silver dial versions. And in rose gold with a silver dial it costs US$15,300.